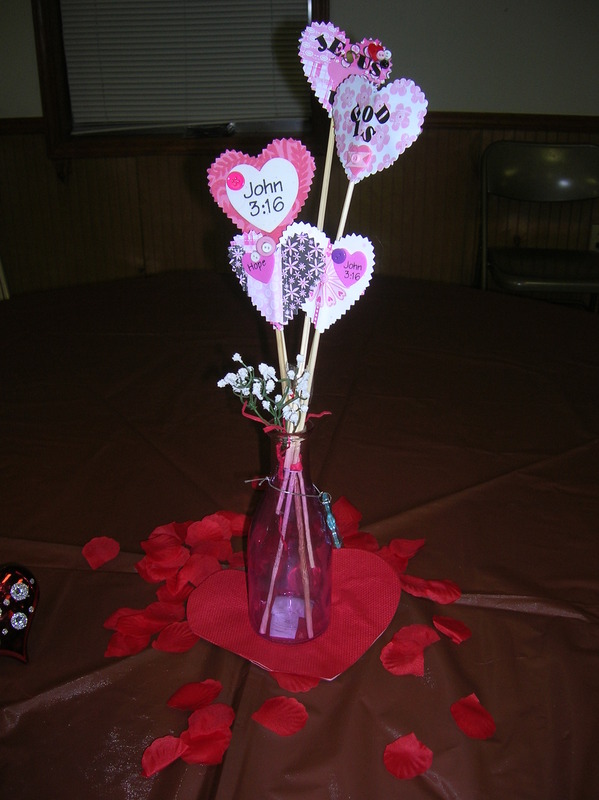 I saw these hearts featured in a Dollar Store Crafts post – “15 Black & White Wedding Ideas” – and just KNEW how I was going to decorate the tables at this year’s Valentine Supper for my Wednesday’s night kid’s group at church! I followed the link back to Rebecca’s site “As Simple As That” and found a blog filled with wonderful ideas, tips, give aways, and all kinds of tuff I can’t wait to try! These are so easy that a tutorial is really not even needed, but I will share a few tips on making these with you (below). 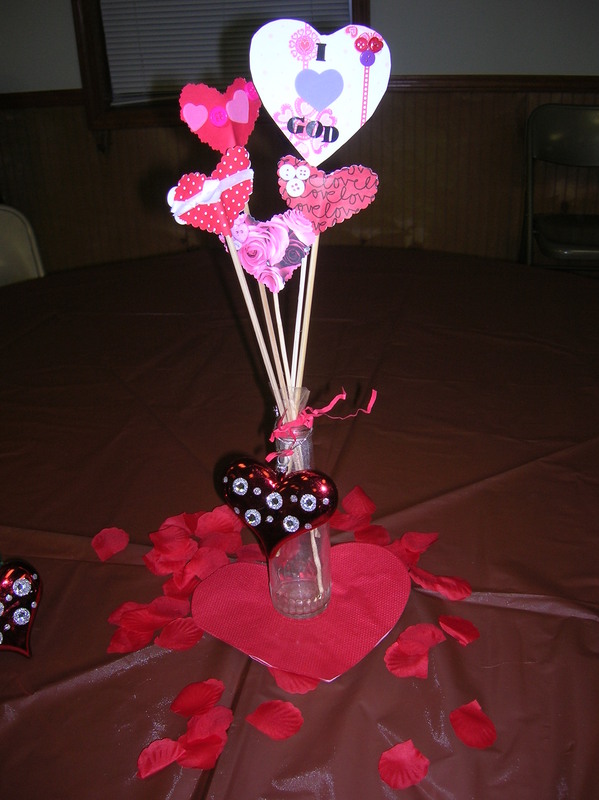 I call my hearts “conservation” hearts because I used them as message boards to the kids and as they were to be used at a church function, I used religious messages like “God is (heart)” and Jesus (heart) u”. This would be such a great, and cheap, way to decorate for every holiday! Stick one or three in a floral arrangement or group five together in a vintage bottle – – – turkeys, hearts, stars, shamrocks, and pumpkins galore! 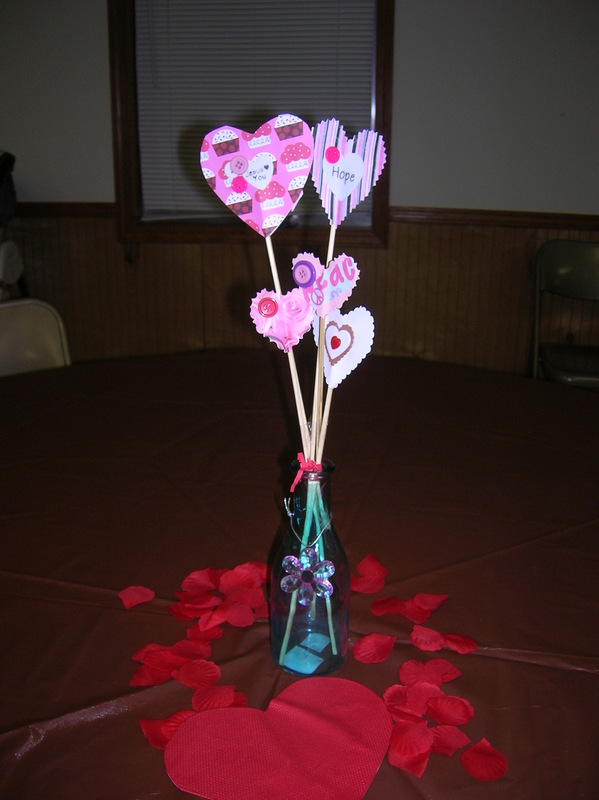 This is the perfect craft for kids – and a great rainy day activity – make a bouquet of flowers for the table or for mom on Mother’s Day. 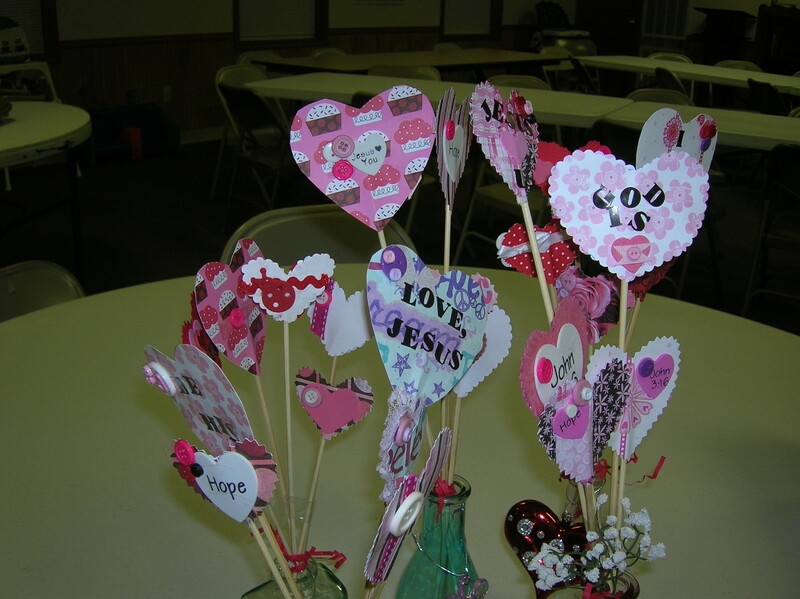 Use heart shaped cookie cutters of assorted sizes to trace hearts. Next cut around the heart in a square (cut 2 pieces). Glue the two pieces of paper together patterned side out ONLY at the top. Then cut out the hearts. Use plain or decorative edged scissors. If you are writing on the hearts, do it now. Snip the pointed end off the skewer. Holding up one heart apply glue to the inside of the bottom heart. Insert the skewer and glue the two hearts together. Decorate both sides of the hearts. Make these as elaborate or plain as you want. Group five together and tie them LOOSELY together with raffia, yarn, etc. String a charm on a length of trim and tie around a bottle. 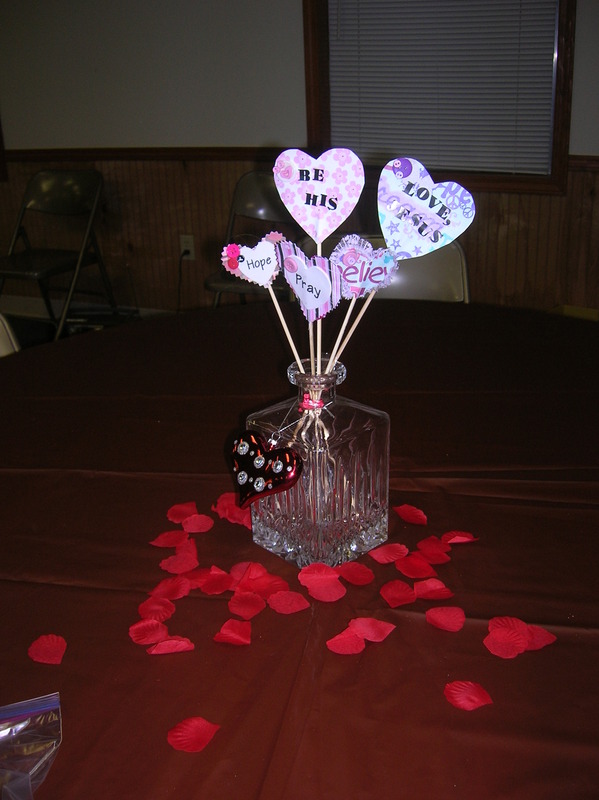 Tape the bottom of the hearts on a stick LOOSELY together with transparent tape. Arrange the hearts so that some are higher than the others. 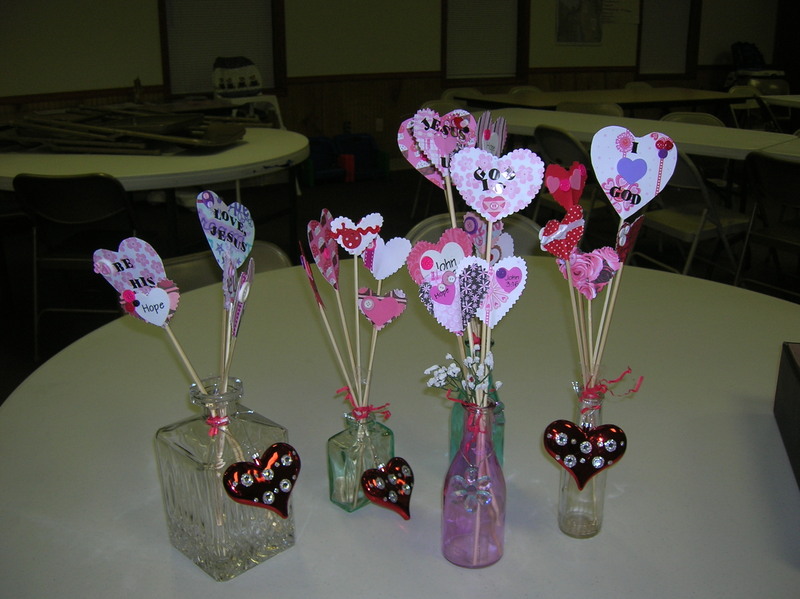 Inset the sticks into a bottle and arrange the hearts in a pleasing manner. Photo 7: Here they are all grouped together! 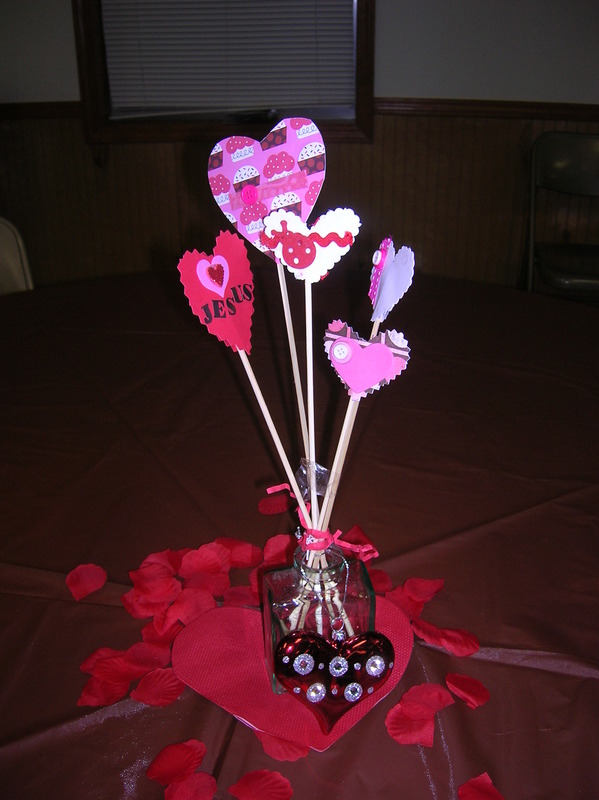 Your whimsical conversation hearts on a stick turned out so beautifully! Thank you so much for visiting me and for leaving such lovely comments at Rook No. 17! I’m delighted to “meet” you and look forward to following your blog.